· To develop a new format for globally benchmarked Integrated City. · To propose a road map for fast track development and implementation. · To make the city scalable in each & every aspect for a distant future. · To derive the city format from fast changing lifestyles & new technologies. · To achieve an image of Global city, that keeps pace with modern technologies. planning, infrastructure development, environmental protection and so on. Getting these foundation principles right is crucial to plan and execute the development strategies. 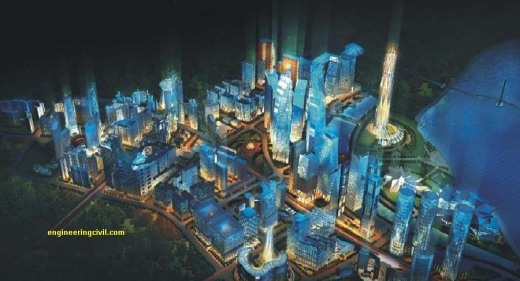 Propelled by a competitive economy anchored on commerce and related industry, GIFT, envisaged as an EcoCity, will serve as the Vibrant Hub of Western India and as a habitat showcasing business oriented, environmentally sensitive growth with equity. The fundamental principles of life and livability lays the foundation for the city. Transit oriented development (TOD) shall be concentrated near transit nodes to make travel convenient for people and serve as multimodal transport. Each transit node also offers hotel & office with commercial facilities. It shall enhance walk to work concept. The tallest tower is located in splendid isolation on the beautiful Fortune Island surrounded by beautiful landscape. The Diamond Tower symbolizes Gujarat’s flourishing diamond industry. Designed to portray the elegant edges of diamond facets, each floor of the tower is different and yet uniquely forming one large diamond. The tall archways of the Gateway Towers frame the majestic Diamond tower and create a picture perfect setting. Astride the main avenue of the city, the Gateway Towers have elaborate terrace gardens and rooftop restaurant. The Gateway Towers draw this design inspiration from Buland Darwaja and herald India’s arrival in the new millennium. A city within a city. One Big organism is what the design metaphorically represents. The design inculcates the notion of a micro system existing in the macro system. The analogy of human body with all its various system of substance the organs, blood vessels, breathing and metabolism system has been interpreted to device the system for the “City Life Body” of blocks. The Guardian of the city. Naga a powerful symbol in India finds a re-interpretation in these buildings. Truly a magnificent first in the world. It has several halls, auditorium and an opera with sitting capacity exceeding 10,000. It’s design is inspired by Salt Crystals and Dandi March. It will also have Eight museums showcasing the history, art, culture and socio economic life of Gujarat. We are thankful to Mr Aakar Shah who contributed this informative article to this website. gift is proud of gujrat……….. and attraction on the world…………. It is unbelievable construction plan we cant even imagine in INDIA. All credit goes to Mr. MODI.